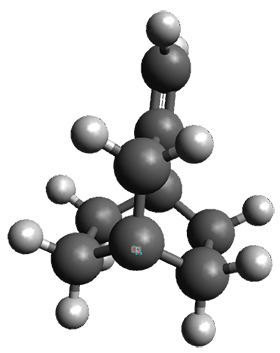 Following on previous work (see these posts on ladderane and hexaphenylethane), Schreiner, Grimme and co-workers have examined the structure of the all-meta tri(di-t-butylphenyl)methane dimer 12.1 In the study of hexaphenylethane,2 Schreiner and Grimme note that t-butyl groups stabilize highly congested structures through dispersion, identifying them as “dispersion energy donors”.3 The idea here is that the dimer of 1 will be stabilized by these many t-butyl groups. In fact, the neutron diffraction study of the crystal structure of 12 shows an extremely close approach of the two methane hydrogens of only 1.566 Å, the record holder for the closest approach of two formally non-bonding hydrogen atoms. To understand the nature of this dimeric structure, they employed a variety of computational techniques. (Shown in Figure 1 is the B3LYPD3ATM(BJ)/def2-TZVPP optimized geometry of 12.) The HSE-3c (a DFT composite method) optimized crystal structure predicts the H…H distance is 1.555 Å. The computed gas phase structure lengthens the distance to 1.634 Å, indicating a small, but essential, role for packing forces. Energy decomposition analysis of 12 at B3LYP-D3ATM(BJ)/def2-TZVPP indicates a dominant role for dispersion in holding the dimer together. While 12 is bound by about 8 kcal mol-1, the analogue of 12 lacking all of the t-butyl groups (the dimer of triphenylmethane 22) is unbound by over 8 kcal mol-1. Topological electron density analysis does show a bond critical point between the two formally unbound hydrogen atoms, and the noncovalent interaction plot shows an attractive region between these two atoms. 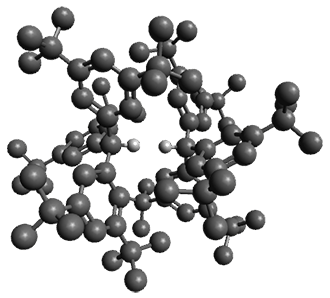 1) Rösel, S.; Quanz, H.; Logemann, C.; Becker, J.; Mossou, E.; Cañadillas-Delgado, L.; Caldeweyher, E.; Grimme, S.; Schreiner, P. R., "London Dispersion Enables the Shortest Intermolecular Hydrocarbon H···H Contact." J. Am. Chem. Soc. 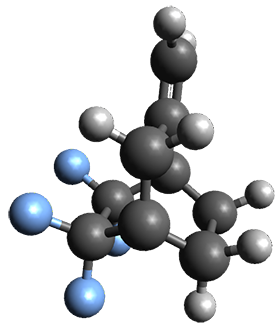 2017, 139, 7428–7431, DOI: 10.1021/jacs.7b01879. 2) Grimme, S.; Schreiner, P. R., "Steric Crowding Can Stabilize a Labile Molecule: Solving the Hexaphenylethane Riddle." Angew. Chem. Int. Ed. 2011, 50 (52), 12639-12642, DOI: 10.1002/anie.201103615. 3) Grimme, S.; Huenerbein, R.; Ehrlich, S., "On the Importance of the Dispersion Energy for the Thermodynamic Stability of Molecules." 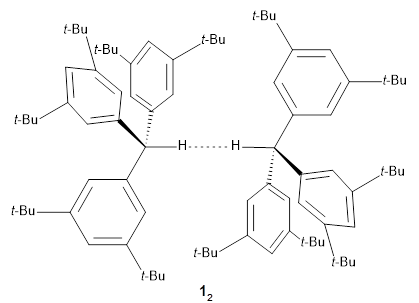 ChemPhysChem 2011, 12 (7), 1258-1261, DOI: 10.1002/cphc.201100127. 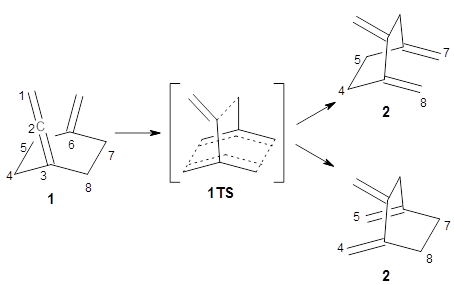 Because of the symmetry of the species along this reaction pathway, the products of the two different rearrangements are identical, and will be formed in equal amounts, though they are produced from a single transition state with the reaction pathway bifurcating due to a valley-ridge inflection post TS. The interesting twist that is explored here is when 1 is substituted in order to break the symmetry. The authors have examined 3x with either fluorine, chlorine, or bromine. The critical points on the reactions surface were optimized at M06-2X/Def2TZVPP. 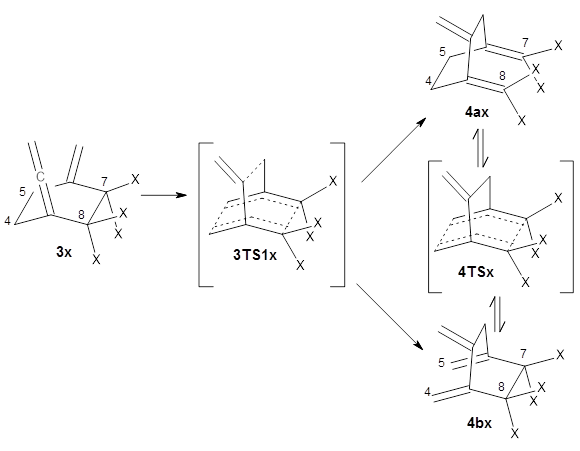 In all three cases a single bispericyclic transition state 3TS1x is found, which leads to products 4a and 4b. A second transition state 4TSx corresponds to the [3,3]-rearrangement that interconverts the two products. 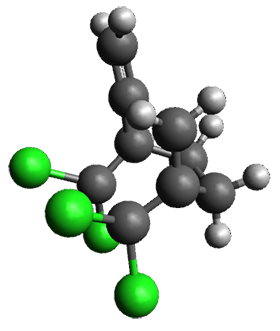 The structures of 1TS, 3TS1F, and 3TS1Cl are shown in Figure 1. Figure 1. M06-2X/Def2TZVPP optimized geometries of 1TS, 3TS1F, and 3TS1Cl. The halogen substitution breaks the symmetry of the reaction path. This leads to a number of important changes. First, the C4-C5 and C7-C8 distances, which are identical in 1TS, are different in the halogen cases. Interestingly, the distortions are dependent on the halogen: in 3TS1F C4-C5 is 0.2 Å longer than C7-C8, but in 3TS1Cl C7-C8 is much longer (by 0.65 Å) than C4-C5. Second, the products are no longer equivalent with the halogen substitution. Again, this is halogen dependent: 4bF is 4.0 kcal mol-1 lower in energy than 4aF, while 4aCl is 8.2 kcal mol-1 lower than 4bCl. These difference manifest in very different reaction dynamics. With trajectories initiated at the first (bispericyclic) transiting state, 89% end at 4bF and 9% end at 4aF, a ratio far from unity that might be expected from both products resulting from passage through the same TS. The situation is even more extreme for the chlorine case, where all 200 trajectories end in 4aCl. This is yet another example of the role that dynamics play in reaction outcomes (see these many previous posts). 1) Villar López, R.; Faza, O. N.; Silva López, C., "Dynamic Effects Responsible for High Selectivity in a [3,3] Sigmatropic Rearrangement Featuring a Bispericyclic Transition State." J. Org. Chem. 2017, 82 (9), 4758-4765, DOI: 10.1021/acs.joc.7b00425.